If you’ve read any of my recent posts, you will notice that I’ve touched on the fact I was feeling pretty rubbish last week. 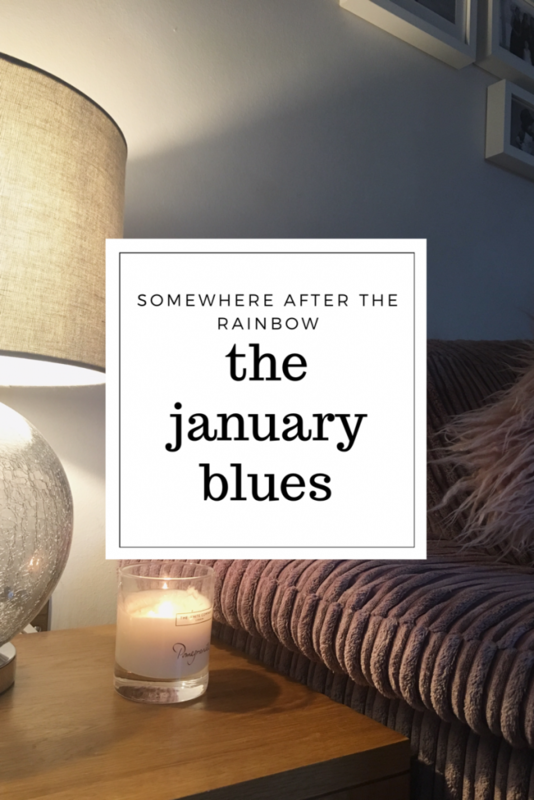 The January Blues hit me big time. For me, it is always a mixture of things in January. The weeks leading up to Sophie’s anniversary, which is February 1st, is never easy. This year will mark 5 years since she was born sleeping. I think her anniversary, coupled with the disappearance of the pretty sparkling Christmas decorations, the dullness of the grey, damp, cold weather, the lack of money after Christmas and the January germs, means every year I seem to struggle through January. Last week I hit a really low point. In my teens I suffered with anxiety – mainly as the result of bullying and feeling the pressure at school. As an adult it affected me in my early twenties, but since having the kids I haven’t had as many occurrences. At one point last week I really couldn’t face getting out of bed. Mason was poorly again and needing regular medication, and it all hit me at once – several things had contributed to the build up, my best friend going back to work, my other close friend moving away, and also I felt Christmas had been a letdown, after I had worked really hard to make it special, and then a lot of plans got spoilt by illness. Wednesday evening, Ell went out to play golf, and I felt so on my own – I ended up having a rant and a cry on Insta-stories – probably not the best use for social media – but actually it helped. I received so many lovely messages from some of the lovely people that follow my Instagram, and it really inspired me to want to feel better. I know a lot of people suffer with anxiety, and for them it is not easy for them to pull themselves out of it. I have always found that positive thoughts, and giving myself a kick up the bum is the way forward for me. I tried medication once in my early twenties, and I found it made me feel worse. At the end of the day you have to do what works for you. I thought with this in mind I would share some of the things that make me feel better when I am feeling low or anxious. I know it is not always a quick fix, but boosting my mood seems to work for me. 1. Pamper Time – I regularly go through phases of feeling frumpy, and stale. Hitting 30 has made this happen more often, as I don’t think of myself as getting older, but looking in the mirror, the eye bags and grey hairs tell a different story. When I’m feeling like this, the best plan of action is a bit of pampering, whether that be booking a hair appointment, a long hot bath and a face mask, or painting your nails. If you feel good about yourself, then facing the outside world is a bit easier. 2. Think Ahead and Make Plans – I’ve spent sometime planning things that we can look forward to in the Spring and Summer, including holidays and some days out we can do. Having something to look forward to always brightens my mood. Also looking at the new spring clothes in the shops or online – you don’t have to buy, window shopping always puts me in a good mood. 3. Hygge – I know this is probably the most talked about term of the last few months, but the Danish Term of ‘Hygge’ – essentially creating cosiness to bring contentment – is an amazing idea. I think snuggling up with a blanket, and the fire (ours is fake but the flames make you feel cosy), and lighting candles can work wonders for your mood. 4. A New TV show – seems a bit daft but on these cold winter nights, finding something that can make you laugh and give you a reason to snuggle up in the evening (see above), is a welcome idea. We’ve recently started watching ‘The Big Bang Theory’ which initially I didn’t think i would find funny, but I’ve got so into it, and its my new obsession. It is also light relief from other things going on. 5. Fresh Air – Get Outside. There is no excuse not to, even with kids. In fact if you have kids, getting fresh air is especially important, as being stuck inside makes you drive each other mad. As long as you have waterproofs and wellies, you are set. Being outside improves my mood so much, and for the kids, being able to run and get muddy is an essential part of childhood. 6. Get Organised – The other evening we sat down and made a list of everything we wanted to achieve with our house this year – mainly finishing off bits, or redecorating others – but having a plan cleared my mind a bit. Other ways of getting organised have included cleaning out cupboards, and meal planning – I always feel better after a decent meal, and having food in the house to cook one is important. I always feel very anxious and stressed when we have a lot of muddle in our house, and so have been working on purging areas of the house that are too busy – in turn this has kept me occupied, and blocked some of the anxious thoughts, as I’ve had other things to think about. 7. Talking – Everyone who knows me knows that I love to talk – some mornings I can be found still outside school chatting at 9.30am. Talking is good for you, and feeling anxious or low is nothing to feel ashamed of. Sometimes, bending someones ear just helps get it off your chest. I’m very lucky that Ell lets me rant away – most of the time I swear he isn’t listening, but it does help. 8. Drink Water – I’m so awful at drinking during the day – so I’ve been trying to up my water intake – and it really has improved my mood – now my skin however that seems to be having a reaction to it – hopefully its on the way to improving though. 9. Make a List – I find it helps to make a list of everything that is upsetting me, or making me feel stressed – silly things like cleaning the bathroom, impending deadlines, or bills that need paying and then work through them one by one, no matter how slowly. It is another way of clearing your mind. 10. Food – Comfort eating isn’t recommended, but having a good hearty meal, like stew, packed with veg, or soup and fresh bread always cheers me up. I am the worst when I am hungry, and I shut down and get very grumpy. Make sure you are eating regularly and healthily – and allow yourself the old takeaway or treat as it never hurts. I hope this is helpful to someone. Thank you again to every lovely person that reached out to me when I was a bad place last week. I appreciated very single message. By Friday I was feeling much better, and even though I am still feeling quite tired and overwhelmed at times, this week on the whole has been a dramatic improvement on last week. I can’t wait for the warmer, brighter days, and obviously I always feel a ton better when Sophie’s anniversary has passed. Roll on the Spring, the drier, brighter, warmer days – and the lack of mud everywhere! 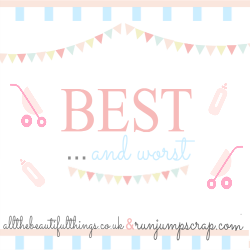 I’ve linked this post with the Best and Worst Linky with the lovely Sarah at Run Jump Scrap and Helen at All The Beautiful Things. Click here to see who else has linked up….